But a new answer to that question has come to me since I’ve been doing my current show, James Graham’s Quiz. Being an actor is about tapping into the people whose stories we tell, the people we work alongside and the people we tell our stories to. To elaborate, I’ve always been an advocate of the egalitarian experience. By my reckoning, no one in the equation of theatremaking is more valuable than anyone else. The very best work is the expansive sum of its many parts. But performing in Quiz has pushed my thinking even further in this direction. 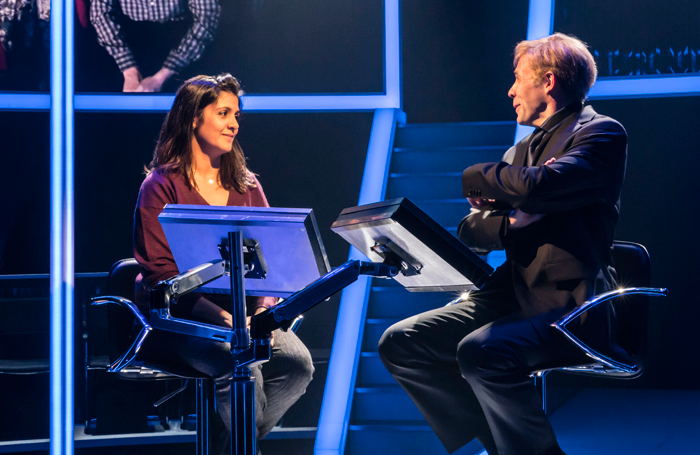 During each performance a pact is formed between us – the people who tell the story and the audience – to make a judgement on the case of Charles Ingram, the so-called ‘coughing Major’ of the Who Wants to Be a Millionaire? scandal. And at the end of each half of the show that is made explicit when audience members register their judgement (guilty or not guilty) on an electronic keypad. In the same way that the best theatre shouldn’t tell you what to think but send you out into the night questioning what you thought you knew, there is no ‘right’ outcome to Quiz. In fact, the end-of-show audience votes vary considerably from night to night. But whatever they vote, we have to look them in the eye at the curtain call and thank them for going on that journey with us. I have never liked aggressively fourth-walled theatre that almost goes as far as to ignore its audience. The way I see it, if the audience weren’t there, it would just be a bunch of people in a room dressing up and pretending for their own pleasure, which is something else altogether. They are there and we do it for them and because of them, even if they don’t respond how we want them to – especially when they don’t respond how we want them to. We can’t just make work in an echo chamber, hearing all the things we want to hear and only talking to the people who agree with what we have to say. It’s all about empathy: active empathy. And that is why I feel lucky to be able to say that I do this for a living, even if I can’t answer questions about what it’s like to be in EastEnders.